We started off with a bang this week as our Primary Grades participated in the annual Ridgeview Hallowe’en Parade. Thank you to all the parents who supported us by braving the crowded hallways with your happy and excited smiles and waves for our littlest pumpkins. We had a fun Hallowe’en Centres Party following the Parade. We use the Centres format frequently, for our morning playtime, math manipulative work and in the afternoon for our Centre focus activities. The children are used to moving between Centres, sometimes in a rotation, and it creates a sense of predictability and smooth organisation which is self-regulatory by its very nature. 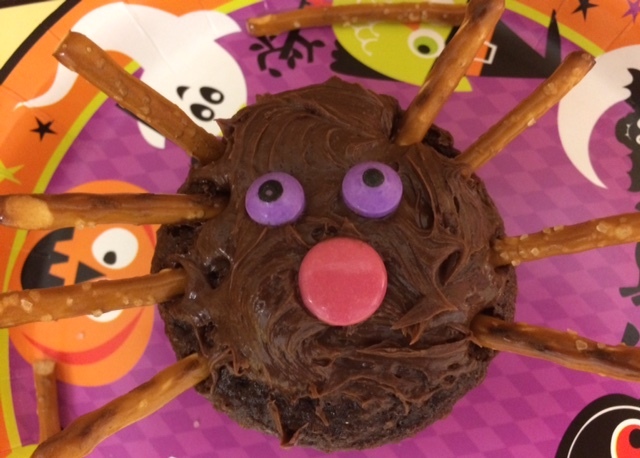 We finished our Hallowe’en bats, made spider cupcakes, coloured our Hallowe’en books and cut out Hallowe’en shapes with playdough and cookie cutters. We had a lot of help from our wonderful classroom parents in the preparation of activities, and leading the children through their tasks. We’ve spent the rest of this week recovering from a late school night and sweet treats. 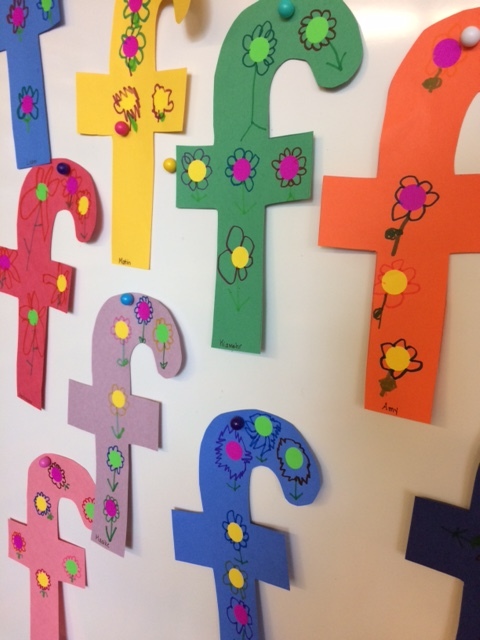 To get our ourselves back on schedule, we concentrated on our Alphabet work for the letter “F.” We’ve been looking for a new craft for “F” and came up with “f is a flower.” The children made these cute flowers using dot stickers for the centres and adding their own petals, stems and leaves in feltpen. We’re pleased with the childrenès continued improvement in letter formation. We’re encouraging the children to use the correct letter formation for the lowercase letters we’ve taught in class (a-f) when printing their names. When your child is printing at home, please gently remind them to use the letters they know how to print in lowercase. There’s nothing like an Emergency Release Drill to snap you out of your sugar haze. On Thursday, our children participated in a full student release following a simulated earthquake emergency. A soundtrack of earthquake noises was played, and the children moved to “Drop, Cover, and Hold” under the classroom tables. After counting to to 60, an alarm signalled us to evacuate the building. Everyone gathered our coats and headed to the gravel field. Once the building was deemed safe, the students returned to their classrooms and waited for their parents to go through the Parent Reception Centre before they were reunited. Our children should all be able to independently put on their own coats, including pulling out sleeves; please continue to practise with your child if necessary. The days following Hallowe’en are now a time for reflection as Remembrance Day is next week. We’re talking about peace in our classes, and what that means for each of us. 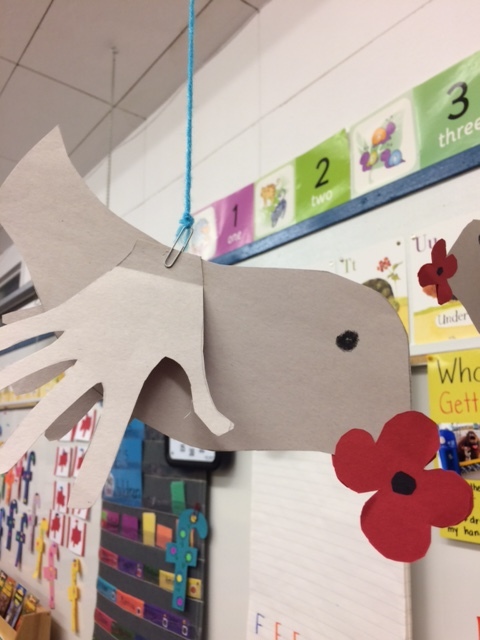 We made peace doves with our Big Buddies on Wednesday, and some children also chose to make a Canadian flag as a choice activity. Our children will attend their first serious school assembly next Thursday as we have our annual Remembrance Day Assembly for students. Students enter and leave the assembly silently, and there is no talking or clapping by the student population. We will front-end load our children with the school expectations, and you can also help us in talking with them as well. Hallowe’en Candy Donation is ongoing. This is a great way to get rid of any extra candy you still have or don’t want lying around the house tempting you! We will use the candy for our upcoming Christmas Cracker project. Donated candy should not have any Hallowe’en themed words or pictures on the wrappers. Monday, November 7 is Popcorn Day. Please send in $1 for your child to purchase a bag. We are hoping to enjoy it as our afternoon snack outside in the sunshine! Wednesday, November 9 is Photo Retakes Day. Please let us know at drop off if your child is planning to have a retake. Monday, November 28-Thursday, December 1 is the Scholastic Book Fair in our Ridgeview library. Students and parents will be allowed to purchase some wonderful books and gifts there. If you are interested in volunteering at this event please speak to our teacher librarian, Mrs. Kennedy.